These days, the Dutch tournament scene is finding its shape. The Gatherings of the Knights of Thorn are becoming must-attends twice a year and now there are two Giant Tournaments to nicely round out the calendar. 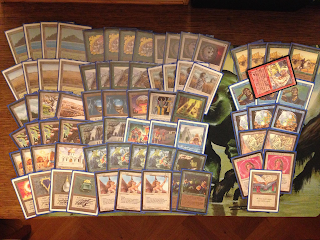 We organized the first of those, The Hill Giant Cup in March two weeks ahead of n00bcon and it was a roaring success. The day after crowning Michel Hollenberg the first King of the Hill (check out the N00bcon stream to enjoy Michel and Mg share precious nuggets of wisdom), questions started about a second installment. Looking at that Other Big One, it was clear when it should be taking place: ahead of Fishliver Oil to send the Dutch Wizards to Genova prepared for battle! 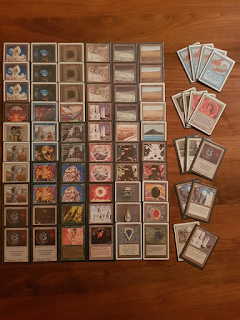 This is my tournament report of Sunday's Frost Giant Cup (7 October 2018). Sunday morning arrives and after the smoke clears 37 players enter the race to win the first Frost Giant Cup. 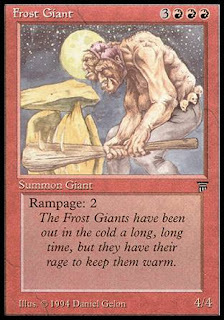 Like at the Hill Giant Cup, Swedish B&R applies with same art same frame reprints allowed (no CE/IE). 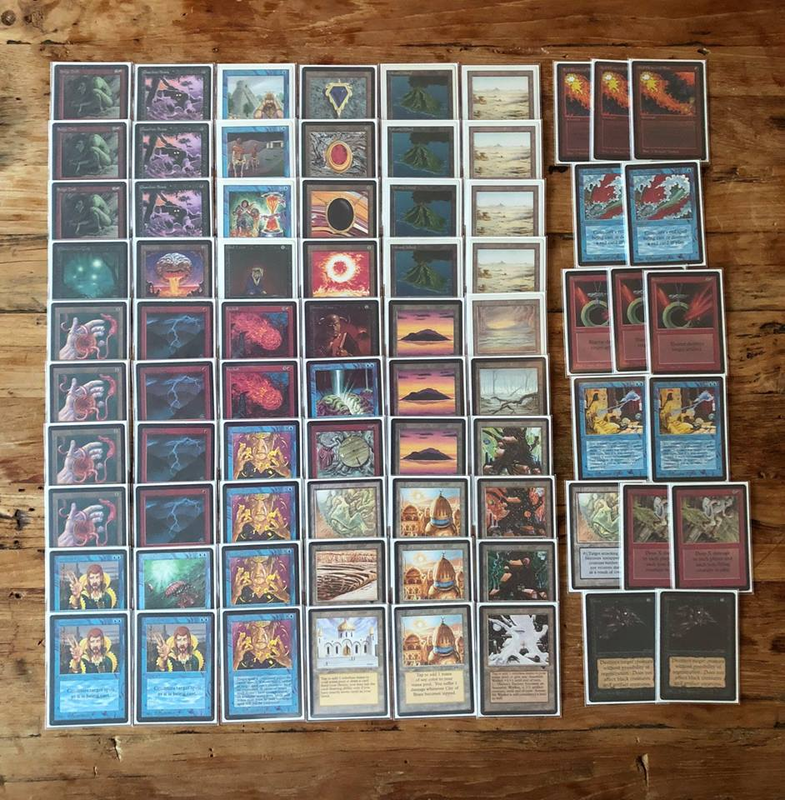 We have a vintage Juzam Djinn poster for the maker of the most creative deck, a Revised Only Side Event, and an oversized Chaos Orb for flippers who miss three in a row. We also have great home-brewed beer again; this time players have a choice between White, Blond, Chestnut and Bock from the Gooische Bierbrouwerij. Although I am organizing, I opt to play a strong deck: GWu Geddonless Ernhamgeddon. I tell myself it is OK to do so, as I will actually be one of the five Dutch guys flying to Genova to play in the tournament that the Frost Giant Cup is supposed to prepare the Dutch Wizards for. Also: it is my favorite deck because of the different roles you get to play depending on draws and match-ups. My deck, including the sideboard and the beautiful signed Frost Giant that we were playing for. Round 2 and I meet Marten's travel companion Frenk. Players like Marten and Frenk and the aesthetically pleasing cardboard they bring are reasons to be in this format. Frenk is usually on some form of powerspice and today is no different: in an otherwise reasonably normal WUB controllish-deck (Abyss/White Knight) he is playing no less than three Shahrazads main board! The first Shahrazad resolves and I happily battle away to send Frenk to 10 in our main game courtesy of some fast Erhnams. Back in the main game, Frenk resolves the second Shahrazad and I remind him it is actually restricted in Sweden... We finish the game regardless, and off the back of some Ice Storms I manage to get the second Shahrazad game as well. Frenk is now down to 5 life in our main game courtesy of his two Shahrazads. The last five are gone in a flash as another fast Erhnam hits the table, this time in the main game. After Frenk replaces two Sharazads for cards from his sideboard, we head into game 2. Proving the wisdom of restricting Shahrazad from a timing point of view, the card is not seen again in this game and I manage to take it within time in the regular way. 2-0 and I am 1-1 for the day. After the lunch break, we start of with a small auction to help out a fellow player who had the misfortune of seeing his Library of Alexandria stolen. 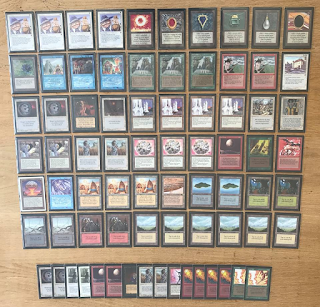 A Legends Land Tax and Greed donated by our house dealer Wijnand Schoenmakers are sold for handsome prices (thanks to Tom Posthuma and Michel Hollenberg for winning those auctions!) and we are good to go for round 3. Round 3 I meet up with one of the new players, Wouter Janssen. He is on some sort of Erhnamgeddon, as I briefly get to see Birds and indeed one Erhnam. My deck turns out more efficient, and I brutally dispatch him 2-0, with timely Swords doing work and fast Ice Storms proving better than unseen Armageddons. Also, I simply play more guys than he has swords. Despite the harsh match-up in this round, this deck does show how lenient reprint rules can allow new players to join and play a deck that can get match wins without spending thousands upfront. Round 4 and I am 2-1. I see another new face in Evert Visser. 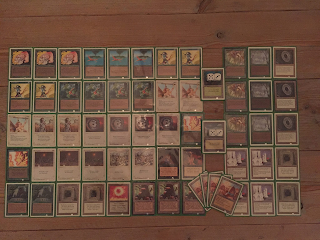 Evert is an experienced Legacy player, now fully bitten by the Old School bug. He brings a very good looking Troll Disco deck to the table complete with Guardian Beasts. He took it to 3-0 for the day at that point and accordingly he turns out to be a tidy player. We exchange games with my loss coming courtesy of early pressure finished of with some burn. My win comes off a well timed Time Walk giving me an extra Swing with the Green Army. In the deciding game, my Ice Storms provide me a head start and I take it from there: 2-1. Having enjoyed my first beer of the day in this match (my favorite, a White Beer brewed with buckwheat), getting to 3-1 I am thinking I might still make it to Top8 if I somehow manage to win the next match. Round 5 couples me with Tom Posthuma, a former GotKoT winner and formidable foe. Also on 3-1 for the day, he is playing a classic UR-burn. Game one sees his Flying Men do quite some damage as my removal is spent elsewhere first. When I finally deal with it, Tom starts sending Chains and Bolts to my head. I somehow find a Swords to gain life and stabilize at one. Thinking I will be dead in moments, I start swinging back regardless. Tom finds variance in his way and draws blanks for what seems like an eternity. I close out the game and can't really believe I am 1-0 up. Game 2 is all about my Ice Storm efforts as I try to block the red sources. I succeed long enough to deal 20 with some help from restricted cards along the way. The match is mine, and I turn out to have one of six 4-1 records. Roy Neijland is the single undefeated player (5-0), and Marten Buhler sneaks through as the best of a large field of 3-2 players. 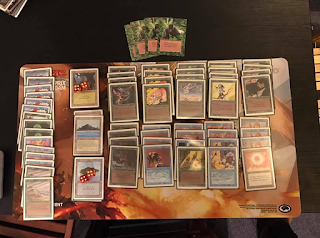 Rounding out the Top8 are Koos Cramer (2) on his Swedish-tweaked version of Randy Buehler's Land Tax deck, my brother Thomas Meddens (3) on his amazing White Tron, Evert Visser (4) on Troll Disco, father to a newborn Richard Veenman (5) on a sweet, sweet Titania's Parfait and Nick Kramer (6) on The Deck. 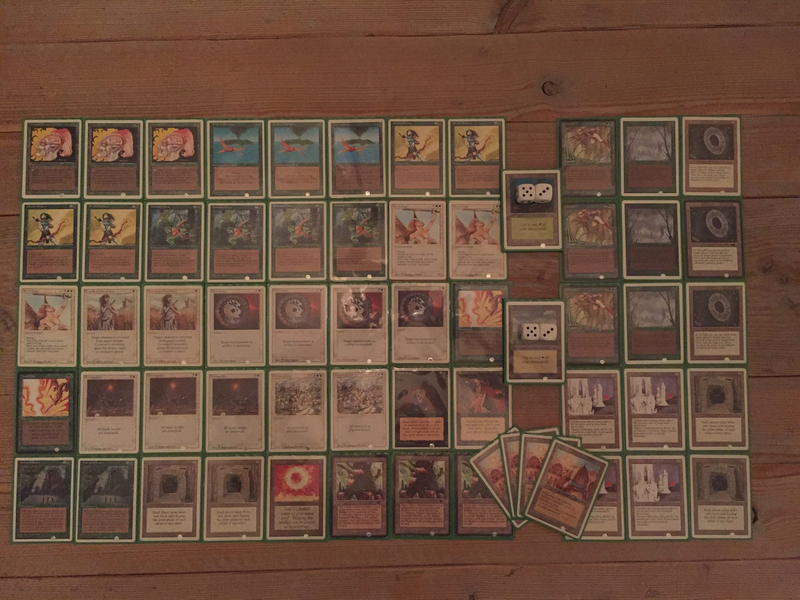 In the quarter-final, it appears a fast ramp deck is a terrible match up for Koos Cramer's Land Tax / Ivory Tower. In about 20 minutes, I take it 2-0, with the one scary moment being a Moat which promptly got Disenchanted. If only that had been a Wrath of God... Meanwhile, in one of the other quarter-finals my brother unfortunately has a problem similar to Koos: he meets a bad match-up and loses to Koos' brother Nick who knows how to pilot The Deck. In the Semi-final I meet Roy Neijland, undefeated for the day. As usual, he is on a mono-Black control list that he has refined to reach remarkable results. Roy is another former GotKoT champion (Mari Steinhage is the third), beating me in the GotKoT 3 final to get that crown. So this is going to be hard, but there is also a veritable chance of redemption here for my Green and White Wizardry against all of Roy's Evil Black Magic. Game 1 and I am out of white sources courtesy of a well place Sinkhole. Being on Ice Storms myself, I really can't complain. Problem is that a wall of Black Knights and Maze of Ith stops me from getting anything green through. When Roy sticks a Hippie I am toast: 0-1. Heading into Game 2, I remember Roy's City in a Bottle(s?). I also remember Roy is mono-black... I side in my four Whirling Dervish to replace the Ernies and basically take it from there. Game 2 and we both see LoA. I just see my land removal earlier than Roy does and manage to live to see all four (!) of the Dervishes. This proves too much for Roy and we head into the decider. In this game I eventually see three Dervishes and also manage to Ice Storm a Maze and Disenchant an Icy to allow them to break through. I get there 2-1 and basically have my Dervishes to thank for it. In the other semi-final, Nick Cramer beat Evert Visser, meaning another Cramer - Meddens matchup would decide the tournament. As the semi's were contested, Gideon Evers crowned himself the day's Revised Master by winning the Revised Only Side Event with his UG Berserkless Berserk-list. 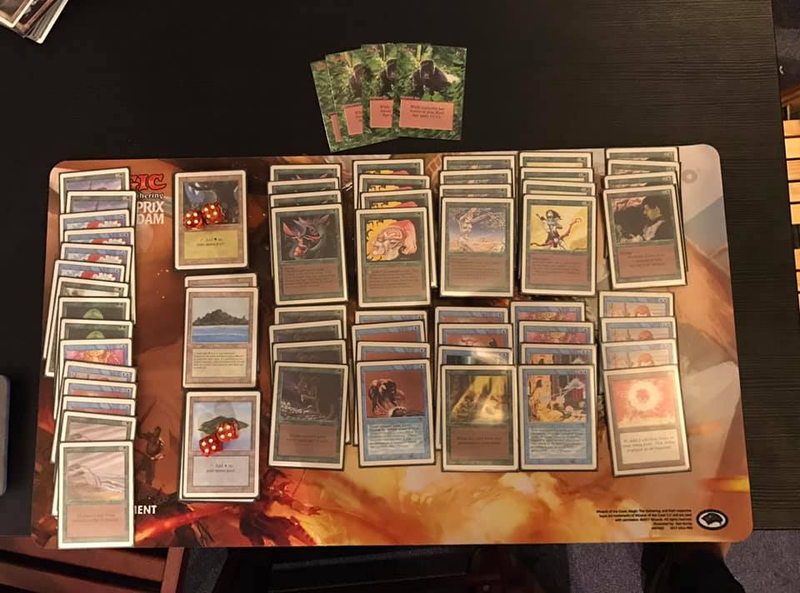 Gideon's Revised Only brew, the Kird Apes were the prize to accompany the pride won. Nick is on The Deck, no easy match-up for any deck. Game 1 of the final I deploy an army of Llanowar Elves to chip away at Nick's life. As I manage to land an Erhnam to come within reach of the final blow, Nick really only has two outs: Balance or Tutor into Balance. In typical The Deck fashion, the Tutor comes up, spitting out the Balance. From there on, I am set to lose and convincingly do: 0-1. 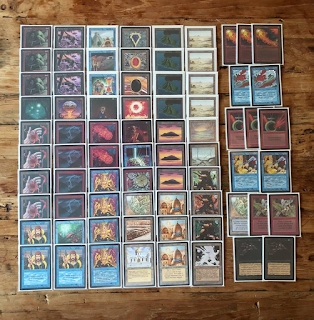 Having seen plan A fail, I go for Plan B and bring in 13 sideboard cards including the four Dervishes and three Psionic Blasts. This effectively turns me into a weenie deck of sorts. Game 2 sees my changed plans more or less working: I manage to keep Nick low on mana and chip him away to 9 before he removes my final threats on the board. With Nick too low on mana up to counter, I have a window to send in a Psi Blast to get him to five. Next turn, as I am tapped out with my hand on 3 cards, Nick goes for a Mind Twist for 2, taking one damage from City in a Bottle in the process (going to four). Nick agreeingly sees me discard a Disenchant and an Energy Flux "that could have been worse". To my great relief, the one card I get to keep is my second Psi Blast, which I cast as soon as I have the lands untapped to do so. 1-1 and fittingly a final match will decide who wins the whole thing. That final game, I fully outpace The Deck with Llanowar Elves and two Dervishes, backed up by Ice Storm. There is no saving Balance this time and I manage to take it over the line: 2-1 and I win the whole thing! Most importantly, the whole day was an absolute blast. 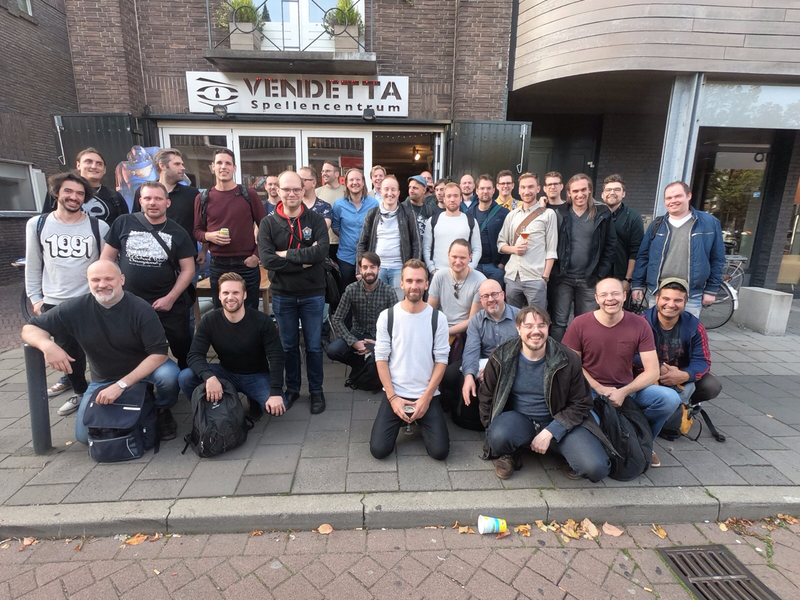 Great thanks go to Robert Kerklaan, owner of our LGS Vendetta, for clearing his store for all of us once again. Thanks also to Wijnand Schoenmakers for providing the top class prizes that were raffled away and organizing the auction. Thanks to Thomas for organizing the Revised Only Side Event. And thanks to all 36 fellow players who traveled to Hilversum for the chance to win a signed Frost Giant. sweet writeup! 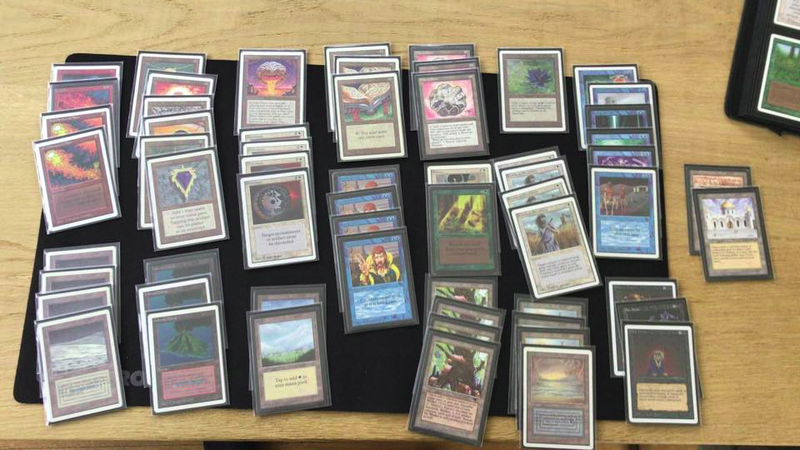 What really caught my interest was the White tron deck mentioned. 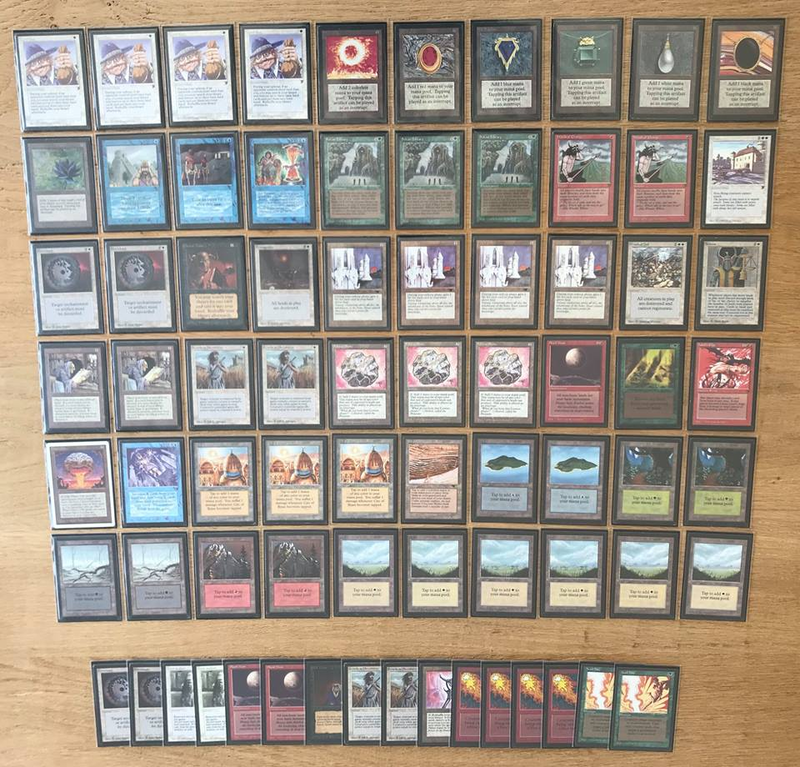 a list (Picture) of tha deck would be awesome, or a short summary. Why not the CE/IE cards btw? no lotus on winning deck? 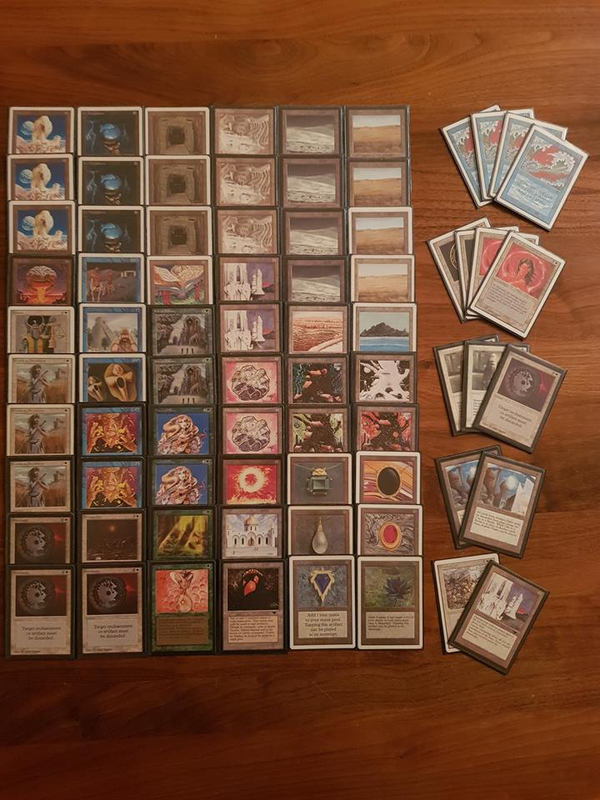 This is the reason that I came back to play (oldschool) magic. Looking forward to the next tournament! 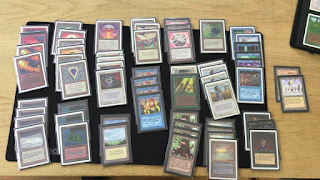 Hi, Is there a deck picture of Roy Neijland mono black control?